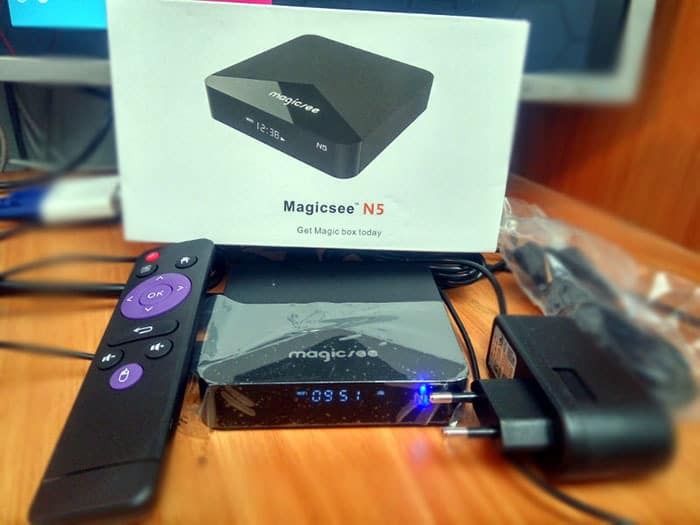 The Magicsee N5 is a solid contender in the entry-level Android TV Box market. This budget-friendly IPTV box will prove its worth with great 4k high-def video and Dolby 5.1 sound. The Android 7.1 OS takes advantage of the balanced 2GB RAM and 16GB ROM with an easy to use interface and smooth menu actions. The extra Micro SD slot adds room for storage and the 2 USB ports allow for wireless keyboard/additional external storage. OTA or Over-the-Air television is still free but the channel selection is severely limited when compared to the vast number of channels available via Cable or Satellite. The problem is, the cost of these paid television services is higher than ever. Cable television companies report average spending per subscriber of about $85 a month, while the average among satellite TV providers tops $100 a month. Many paid television subscribers have been looking for a way to cut the cord. But how do you get the channels you want without the high prices of Cable or Satellite TV? 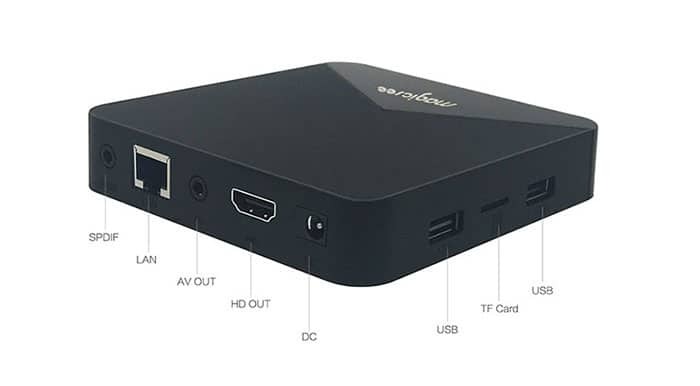 Enter the low-cost Internet Streaming TV provider and the budget-friendly Android TV Box. Demand for a cheaper alternative to traditional TV viewing has resulted in an explosion of growth in this new field. In a very short time, this burgeoning young industry has created 100’s of IPTV (Internet Protocol Television) service providers and dozens of different devices used to watch these services. Why? Because the average cost of an IPTV subscription is $16 a month and the entry-level cost of an Android TV Box is around $30-$40. That’s a 70% reduction of the cost of Cable or Satellite TV services. These IPTV providers offer channel line-ups equal to or better than the most expensive Cable or Satellite service packages. Many offer their equivalent of a DVR with catch-up services and movies on demand as well as pay-per-view sporting events. The Android TV Boxes are now providing 4K resolution with Dolby 5.1 sound. You get an Electronic Program Guide (EPG) and an on-screen menu that’s as easy to use as any Cable or Satellite TV Box. One of these new Android TV Boxes is the entry level Magicsee N5. At around $40 the N5 has everything you need in an Android TV box to get started viewing IPTV. The N5 can output 4k resolution and 5.1 Dolby audio. It runs Android’s 7.1 Nougat operating system which has proven to be a stable platform for IPTV services. It comes with 2GB DDR3L RAM and 16GB eMMC of ROM which is one of the most successful combinations for Android TV Boxes in this price range. There’s also a slot for a Micro SD card for up to 64GB of extra storage. The box’s processor is the well-proven Amlogic S905X chip including an ARM Cortex-A53 quad-core processor and a Mali 450 penta-core video accelerator which supports playback of almost all known media formats including H.264, H.265, VP9 decoding, and HDR10. It boasts dual-band WiFi 802.11b / g / n 2.4Ghz/5Ghz and Bluetooth 4.1 along with a 100Mbps Ethernet adapter port and 2 USB 2.0 ports. Other peripheral interfaces include analog audio/video outputs and digital audio output. It also sports a 7-band LED front panel. The Magicsee N5 isn’t just for IPTV. You can stream movies and TV shows from Amazon, Netflix, Hulu, YouTube, Vudu, and many other services. If you’re a frequent user of social media there are apps for that too. You can also copy your music library and family pictures to the N5. You can play a multitude of games on the N5. However, some graphics intensive games might slow the system down a bit. In the Google Play Store you can find hundreds of apps you can use to get news, weather, sports scores, and much more. This is where the optional storage via the Micro SD card comes in handy. While the N5 isn’t going to take the place of your PC or Mac, it can become a media center for your Home Theater. If you have Plex on your home computer and you’ve used it to play movies, you can install a Plex app that will allow you to connect to any local computer with a Plex server. This also holds true for any music you’ve downloaded. Combine an IPTV service with the media on your Plex server and you have an all-in-one-device solution for TV, movies, music, family videos, and pictures. Imagine no more bird’s nest of cables and multiple pieces of electronics gear stacked around your TV like an electronics store showroom. 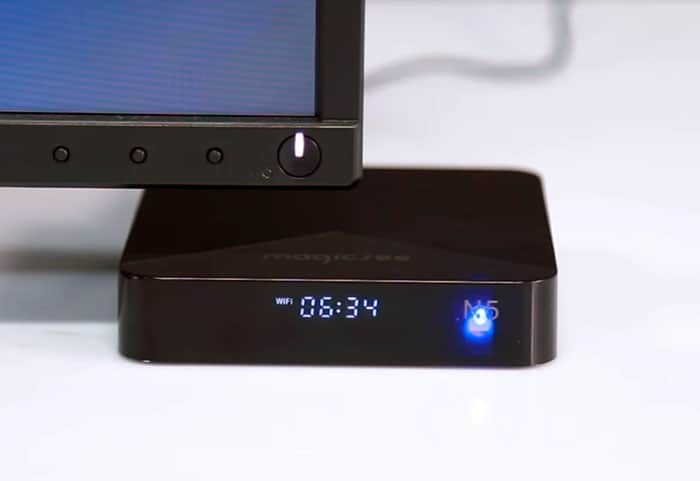 As mentioned before, the Magicsee N5 is an entry-level Android TV Box. It may not have the horsepower or feature-set of the higher end boxes, but even at this low price point, it gets the job done in good fashion. And, entry-level boxes are a great way to try IPTV and the Android TV Box experience and see if it’s right for you. If you do get addicted to this little box, you can always spring for something more expensive later on. So, with all the choices, how do you decide which Android TV Box is right for you? The best way to start is to compare the specifications of the different devices. All specs being equal, the price is usually the first factor in making your decision. You can also read other reviews by people that have already taken the plunge and bought the N5. Finally, the seller must play a role in your buying decision. Check the reviews of the seller as well as the box itself. Once you align device, price and seller, you’ll be ready to start your adventure. Take your time though. If you rush into a buying decision you’ll be sorry you did. A little homework will save you time, money and a lot of frustration. If you really want to cut the cord, don’t waste your savings. If you’re looking for a great deal on the Magicsee N5, GearBest has it on sale at 20% off for a limited time.